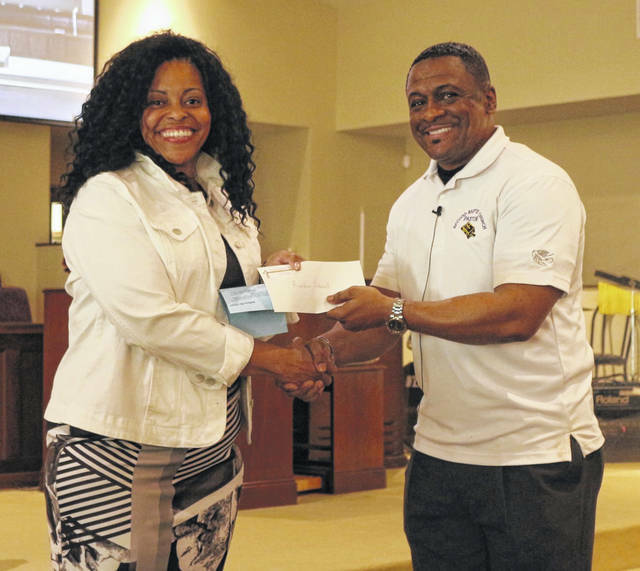 Lisa K. Bradley (left) Freedom School Site Coordinator for the Children’s Defense Fund receives a $1,000 check from Pastor Dennis Ward, president of the Lima Area Black Ministerial Alliance. LIMA — The Lima Area Black Ministerial Alliance presented a check for $1,000 to help fund the Lima Freedom school. The school is a partnership between the City of Lima, area schools, businesses and churches. It is designed to help children with several areas. “The Freedom School actually started in the ’60s, sometimes people think it’s just new. We collaborated with the [United] Methodist Church about three years ago and there was a need to actually teach some of the children when they’re off during the summer months. Sometimes they lose their skills, they lose some education along the way because of the summer. We want to invest in our kids, not just financially, but we have people that go in and talk to them about their reading skills and math. Last year they increased their scores by 90 percent,” said Pastor Dennis Ward, president of the Lima Area Black Ministerial Alliance. The Lima Freedom School for this summer begins June 18 and runs through July 26, meeting Monday through Thursday at South Science and Technology Magnet School. “Last year we tried to do it in two locations but because of logistics, it was a bit difficult. I think having it in one location it will help the students as well because we’re not trying to go back and forth,” Ward said. The collaboration also includes Lima City Schools. “Most of these kids are from the Lima City Schools so when they go back at the beginning of the year, they’re not trying to get acclimated back to school, they’re already there,” said Ward. The Children Defense Fund administers Freedom Schools across the nation. “They are currently one of our nation’s best advocates for children and families and they have, as part of their mission, to educate children on the Civil Rights Movement, which happened some time ago and is currently happening today and also civil and social justice is also a big community piece of having our children grow up to be communally minded and civically minded so these are all opportunities. The way Freedom School works is it’s either a partnership between several entities in the community. Here in Lima, it’s a huge partnership with Lima City Schools, several corporations including Proctor and Gamble, the Ministerial Alliance and many others. We are thankful that they sponsor us because, without community partnership, we would not be able to have the program that we have,” said Lisa K. Bradley, Children’s Defense Fund Site Coordinator at South. https://www.limaohio.com/wp-content/uploads/sites/54/2018/06/web1_Freedom-School-toned.jpgLisa K. Bradley (left) Freedom School Site Coordinator for the Children’s Defense Fund receives a $1,000 check from Pastor Dennis Ward, president of the Lima Area Black Ministerial Alliance.